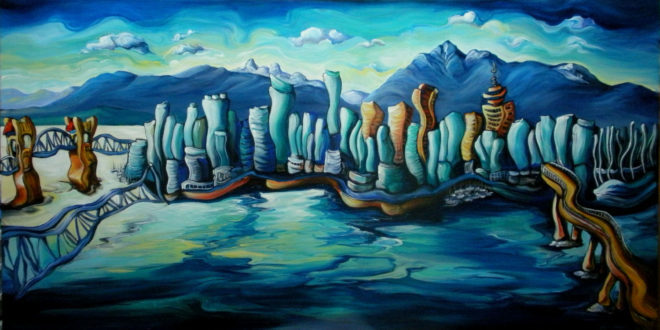 This is a larger version of my Vanorama painting with more focus on the water and the iridescent quality of the western light reflected in the glass and metal buildings. I love this view. This, to me, is quintessential Vancouver. The bridges, the Oz-like radiance in the setting sun, and the jagged mountainscape backdrop. There’s an almost unreal and unreachable quality to the downtown peninsula of Vancouver.